The Skrull race originated on the planet Skrullos in the Drox system of Andromeda Galaxy hundreds of millions of years ago. Early in the evolution of the Skrull race, the star-faring race of genetic engineers known as Celestials visited Skrullos. The Celestials experimented upon the race, creating 3 different types of Skrulls. They bestowed a series of longevity genes upon 1 group, creating a race of Skrullian Eternals (equivalent to Earth's Eternals). On the 2nd group, they implanted a latent gene series that would promote rapid benevolent mutation when the race matured. Finally, with the 3rd group, the Celestials created a race of Deviants (equivalent to Earth's Deviants). The Deviants developed shapechanging ability. Using its ability to change shapes, the Deviant race soon dominated the planet. It eventually eradicated the other 2 Skrull races. The Deviant Skrulls then turned their attention inward. It is unclear whether the Celestials created 2 types of Deviants, or whether the Deviant race evolved into 2 separate races. In any case, part of the Deviant race changed into a horrible, sorcerous offshoot called the Dire Wraiths. The "normal" Deviant majority soon attempted to eradicate the Dire Wraiths, but the Wraiths used their sorcery to flee to the Dark Nebula. After developing interstellar travel, the Skrulls used their shape-shifting powers to establish a galaxy-wide empire. Although extremely imperialistic, the Skrulls were not militaristic, and based their empire on trade. Their shape-shifting powers allowed them to foster bonds of affection and trust with their trading partners. Where this failed, their shape-shifting powers aided them in infiltrating and undermining opposition. About 10 million years ago, the Skrulls ventured into the Greater Magellanic Cloud and encountered the Kree. The Skrulls soon found themselves embroiled in a vast interstellar war. In order to survive, the Skrulls quickly developed a ruthless, militaristic culture that lauded deviousness and aggressiveness as much as their previous culture had praised business sense and hard bargaining. This war has raged for millions of years now without any significant peace. Thousands of years ago, Skrull scientists created the first Cosmic Cube, which could transform thoughts into reality. The powerhungry emperor used it to expand his personal influence and holdings throughout the empire. Years later, the Cube developed a consciousness of its own. Unfortunately, the Cube patterned its personality on that of the power-hungry emperor. It destroyed 2/3's of the Skrull empire before realizing it had made a mistake. The Skrulls patiently rebuilt and continued their long war with the Kree. Not so long ago, a would-be Skrull ruler set off a genetic bomb(Hyper-Wave bomb) that destroyed the shape-shifting powers of all Skrulls. Every Skrull became permanently trapped in the form he occupied at the moment of detonation. Aside from leaving an untold number of Skrull spies trapped in alien body configurations, the genetic bomb cast the Skrull empire into anarchy. A half-dozen rival planetary rulers have claimed the lmperial throne. The empire has been forced to divert a sizeable portion of its war resources to settling internal disputes. Only the fact that the Kree empire followed the Skrulls into anarchy shortly after learning of their enemy's weakness has saved the Skrulls. After some time the empire of the Skrulls was restored. Not long after this the latest herald of Galactus, Nova, led her master to the Skrullian throneworld. The Skrulls tried to fight Galactus with all their might but naturally to no avail. The Skrullian Throneworld was utterly destroyed. This plunged the Skrulls into chaos again. But the Skrulls also overcame these problems under the guidance of their new empress S'Byll. Just after she had became empress of the Skrulls they were attacked by the alien race known as the Badoon who were secretly aided by the Kree. S'Byll tricked the Silver Surfer into joining them and the Kree retalliated by attacking the Surfer's homeworld Zenn-La. Silver Surfer and S'Byll with her fleet followed the Kree to Zenn-La but they were soon overmatched. Then S'Byll's consort Kl'rt the Super Skrull convinced Silver Surfer to use his cosmic powers to restore S'Byll's shapeshifting powers and the allow her to do the same to the other Skrulls. Zenn-La forces joined the Skrull and Silver Surfer but the battle wasn't ended before Silver Surfer forced an audience with Nenora, supreme leader of the Kree, if he would leave Zenn-La forever the Kree would abandon their attack. The Surfer left and the Kree and Skrullian forces returned home. S'Byll made the planet of Satriana the new throneworld of the Skrull Empire. S'Byll then began restoring the shapechanging powers to loyal followers. After many internal struggles against rival claimants to the throne S'Byll once agian ran into the Kree. When treachery cost them their military leader the Skrull were soon defeated. Only S'Byll survived by using her shapechanging powers. Because Nenora had kidnapped Shalla Bal, empress of Zenn-La, because she had found out that Nenora was actually a Skrullian spy who had wanted to build her own empire, the Silver Surfer and S'Byll agreed to attack Hala, the Kree homeworld, themselves. They invaded the palace of Nenora who then was killed by S'Byll. The Kree were gratefull for the uncovering of the treachery and agreed to a truce with S'Byll that would allow her to rebuild her forces. Even more recently Skrull agents, knowingly or unknowingly working for the Kree Supreme Intelligence, were instrumental in starting the Kree-Shi'ar war. What exactly was their purpose in unknown although they could have been paid or controlled by the Supreme Intelligence. Note: Although basically reptilian, Skrulls share certain characteristics with mammals. They have hair and, despite the fact that young Skrulls hatch from eggs, mothers nurse their children to provide nourishment. Popularity: -5 on Earth and other worlds; 0 on Skrull worlds. Weakness: Same as Normal Humans. 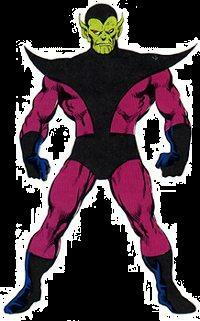 Contacts: Planet Skrullos (original Skrull homeworld destroyed by Galactus), Planet Satriana (new Skrull homeworld). Popularity: -10 on Earth and other worlds; 0 on Skrull worlds. 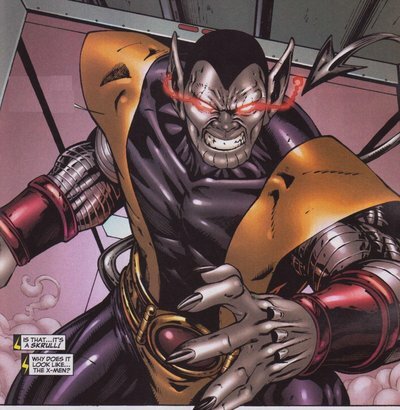 War-Skrulls are genetically imprinted through artificial means with DNA/RNA from countless races. Most of the DNA/RNA used in the imprinting comes from superhumans of Earth. Most have been selectively imprinted with powers that enhance their ability to infiltrate enemy strongholds as well as neutralize specific targets. Weakness: War-Skrull DNA/RNA is less stable than normal Skrulls. It bears an identical genetic template for the X-gene found in random mutants. This makes them vulnerable to biological weaponry that targets mutant DNA/RNA (Legacy Virus). Because they have no antibodies to fight such diseases, their immune systems are -4CS against them. War-Skrulls can have regenerative powers but must control them consciously. War-Skrulls must make a Green Endurance FEAT when taking damage equal to their Endurance rank, Yellow when +1CS, and Red when +2CS. If the FEAT is not successful, the War-Skrull automatically shifts into its true form.